Joseph Cotten stars in Sergio Cobucci's grimly toned Spaghetti Western with an Ennio Morricone score. DVD Anchor Bay USA R1. 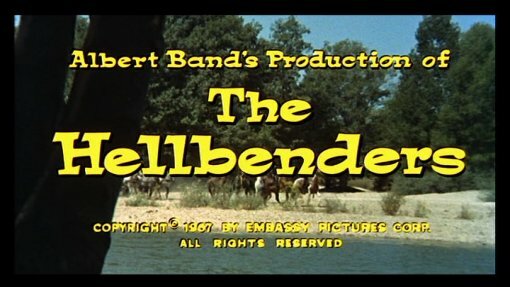 Co-written by producer Albert Band, The Hellbenders is a relatively traditional 'convoy' story, similar to the classic Second World War films where soldiers in disguise are trying to get past enemy patrols in order to achieve their objective - the big twist here is that the main characters are actually, technically, the bad guys and it this this that makes the film so distinctive. While Jonas, the father of the group, is doing what he does for reasons that he considers to be valid (although hardly sympathetic), his two sons Jeff and Nat seem to be in it for nothing more than the money and the love of killing. Ben is the most sympathetic of the group and certainly the closest that the film comes to having a 'good guy' - but he still chooses to go along with the plan and passes up more than one opportunity to turn the group in. This characterisation is reflected in the film's generally grim tone - like Corbucci's earlier Navajo Joe (1966) and Django (1966), there is barely a hint of humour in this entire production and the script is particularly unmericful to background characters. The only scene that doesn't gel with this tone is a sequence with a beggar towards the climax, which seems to serve no purpose except for some light comedy. For a convoy film to work, the situations the characters find themselves in need to be believable and the script does work well in this department. Less effective, and the film's only real failing however is the pacing - it takes a little while to get into the film and although the searches are tense, the presence of three similar sequences does become a little repetitive. Fortunately the film really picks up for the climax and concludes in a superbly fitting manner. Cobucci had made his name with the unconventional Django, but goes back to a more traditional looking Western here, with all of the famous Spanish locations. A few of his more creative shots do sneak in, notably when camera's tumbles along with Jeff's brutal fistfight and the superb gothic horror atmosphere of the grave digging sequence. Ennio Morricone provides another strong soundtrack that really suits the film. Joseph Cotten had been a big Hollywood star in the 1940s before a short time in retirement saw him relegated to television work, until he accepted the call from Europe. He was no stranger to Westerns having topped the cast list on a pair in the early 1950s and his performance here is a genuine powerhouse managing to completely convince in the role - it is genuinely hard to imagine that anyone else could have been as effective. Corbucci regular Gino Pernice (always very remniscent of Quentin Tarantino, particularly in the part he plays here) plays one of the sons alongside a rare non-sympathetic role from the babyfaced Ángel Aranda. The script is not perfect but Joseph Cotten's acting is and Sergio Corbucci provides a strong directoral turn backed up by another fine Ennio Morricone soundtrack to make this a recommendable Spaghetti Western. It will probably not make any top 10 lists, but should be high on the list for genre fans to track down. A must have for Corbucci fans. Anyone famous in it? Joseph Cotten - a Hollywood star in the 1940s he later appeared in a number of Eurocult films during the 1970s. Directed by anyone interesting? Sergio Corbucci - one of the best known Spaghetti Western directors, responsible for the revolutionary Companeros (1970) and the uniquely dark and grim Great Silence (1969). Any violence? Quite a bit of blood but no gore. Good Soundtrack? Another superb Ennio Morricone score. Recommended to Spaghetti Western fans and a must-see for Corbucci fans. Visuals Original Aspect Ratio - 1.85:1. Colour. Anamorphically enhanced. Picture quality is good but often very grainy. Audio English mono - comes through fine. The DVD case includes a postcode poster. Other regions? Previously released on Japanese DVD, a Spanish disc and a low quality US DVD are also available. Not the best of Corbucci's work, but an impressive directoral and acting turn make this film recommendable. A good looking and sounding disc with a good trailer (sadly none of the main cast are still alive to interview so the absence of any extra features can be excused). Find our other Spaghetti Western, Ennio Morricone and Sergio Cobucci DVD Reviews. All text in this review written by Timothy Young - 1st September 2008.